EX-L trim, White Orchid Pearl exterior and Ivory interior. Excellent Condition. Heated Leather Seats, Moonroof, Satellite Radio, Aluminum Wheels, Premium Sound System, Serviced here, Non-Smoker vehicle. 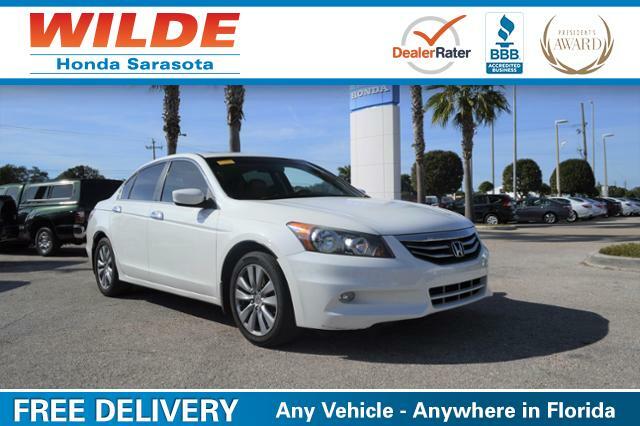 Leather Seats, Sunroof, Heated Driver Seat, Premium Sound System, Satellite Radio MP3 Player, Remote Trunk Release, Keyless Entry, Steering Wheel Controls, Child Safety Locks. Honda EX-L with White Orchid Pearl exterior and Ivory interior features a V6 Cylinder Engine with 271 HP at 6000 RPM*. Serviced here, Non-Smoker vehicle. One of Car and Driver’s 10 Best Cars a record 24 times during the past 28 years. Honda has the highest owner loyalty of any brand. Received 5/5 Power Circles for Overall Initial Quality and 4.5/5 Power Circles for Predicted Reliability from JDPower. Pricing analysis performed on 1/7/2017. Horsepower calculations based on trim engine configuration. Please confirm the accuracy of the included equipment by calling us prior to purchase.